Ultrasonic Cleaner, Myriann Mini Cleaning Machine 300ml Tank for Jewelry Eyeglass Watches Business Commercial Home Use (Pink) by MYRIANN at Samuel Young Lab. MPN: 100148_PK. Hurry! Limited time offer. Offer valid only while supplies last. -Adapt Ultrasonic technology with powerful 40KHZ frequency system. 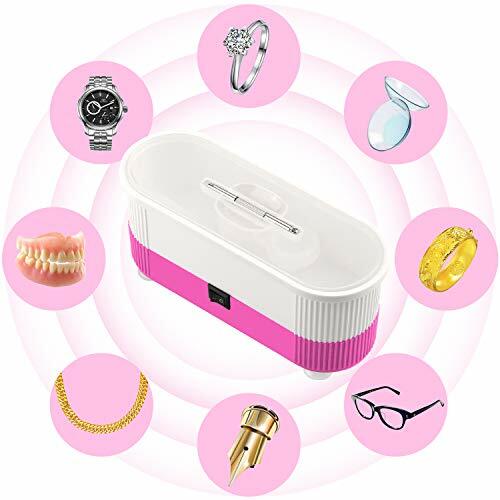 High working efficiency to clean your jewelry, bracelet, necklace, eyeglasses, and etc. -Lightweight and small size, super convenient to take. Only required with 2 * AAA batteries (Not Included), very easy to use. -4 rubber leg holders keep the device stable and safe. -Equipped with screw drivers to tighten your eyeglass in case of any screws loose. -Provide contact lens cover to help you clean your contact lens.